To celebrate our surviving our first week watching A Thriller A Day, we thought it would be interesting to go behind the scenes with a series of blog posts talking to some of the fine folks who worked so hard to bring us the DVD set. They're responsible for the extras we'll be enjoying, including numerous audio commentaries. Who better to start with than Steve Mitchell — the producer of the special features for the DVD box set of Thriller, a role he had previously filled for the TV series Combat! We were particularly interested in his background producing bonus DVD content, and Steve was kind enough to oblige us. PE: Can you tell us how you got into the role of providing extras for DVDs like Thriller? Steve Mitchell: My friend Steve Rubin heard that Image was going to do Combat some years back, and he just called them and offered to do some special features. Steve and I are huge fans of that series, and we thought we could bring some passion along with historian and journalist credentials that set us up as good candidates for the job. As is often the case we barely got paid, but it was important for us to be the guys who produced the extras. Frankly, I wanted to be the first Combat fan on the block to hear the anecdotes about the series. I produced the extras on my own after Season One. I had to, because the idea of anyone else doing them was just not acceptable for me. Luckily, the series sold, and I did make some cash for the later seasons. JS: Sounds like one of those ideal situations where what started as a labor of love evolved into a profitable profession. Being so familiar with the show must have helped when recording the commentaries. Can you tell us about that process? SM: I became the on "air" interviewer when one of the Image editors suggested that I "host" the commentaries. I was doing them prior as the invisible interviewer; I asked questions then I was cut out later. They felt that I had a good voice, and because of the way I was chatting up the guests before we got started it might make for a less formal and more conversational track. Also, it would save time in post, with not having to cut me out. I was game and it worked out, according to them, pretty well, so I became the voice of Combat on the commentaries. I was a film journalist earlier in my career, so I had that skill, plus, I knew the show, and like most fans... I was nosy. I enjoyed doing those shows, and I wish I could have done some more. PE: Before we get to Thriller, what are some of the other DVDs have you worked on? SM: I have done other projects like Never Say Never Again, Sleeper Cell, and Casino Royale (1967). PE: How tough is it to get a project like this off the ground? Obviously it's not going to sell the numbers of CSI or Fraiser, so how do you motivate a company to get excited about something like Thriller? SM: Most of the time the companies, like Image, purchase the license to release the film or series on DVD, and now Blu Ray. Then they decide if they want to take the time and the expense to create special features. In the case of Thriller, Image sought out the series, and licensed it. I remember pitching it some years earlier, but that idea was met with some apathy. Maybe they did a profit and loss projection then, maybe they just did not care about an old B&W TV series. I'll never completely know. But things evolve with time. Nathaniel Thompson who was/is a fan of the show, and an employee of Image, may have pushed from the inside to get the show done. People listen to the guy or gal on staff more than they listen to a freelancer like me. 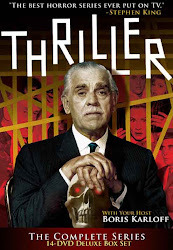 JS: I always assumed that if Thriller was going to be released on DVD, it would have been in the wake of the successful releases of the complete runs of The Twilight Zone and The Outer Limits. SM: Time ultimately makes some shows more attractive as the company has a pipeline that needs to be filled. However things are changing rapidly, and downloading, along with the economy, are impacting the shows that are picked for release. Special features in many ways are an endangered species because of lower sales. Saving on the expense of producing the extras in some case may increase chances for profit or breaking even, which does matter these days. PE: So we should not only be thankful that we got the entire series released at once, but with such a bounty of extras. SM: Ultimately any project that gets produced and manufactured these days is looked at as something that might make money. Pure and simple. For fans of old TV, the best way to get heard is to buy shows like Thriller and send the message that there is a base out there that wants classic TV with extras, and is willing to pay for it. PE: Speaking of Thriller, how far back do you go with the show? SM: I missed Thriller as a network show back in the 60's. I was too young. I actually became acquainted with the show via laserdisc, and bootleg DVD's. The show was a legend though with friends who were fans of the show like Jim Wynorski, Ron Borst, and my co-producer Gary Gerani. My first impression was that it was very well produced, atmospheric, and had great music. I'm a big fan of Jerry Goldsmith and Morton Stevens, and their stuff is a real standout series component for me. PE: So you had done Combat with Image. Did they approach you to work on Thriller? SM: I was having lunch one afternoon with Nathaniel Thompson, and he mentioned, sort of casually, that they were going to release Thriller on DVD. I immediately started to lobby to produce the special features. Nothing happened for months, and then I got the call from Nathaniel that Thriller was a "go" project. Would I be interested in producing the extras? You know my answer. Only downside was there was very little time to get it done, which is why there are no documentaries in the set. They would have taken too long to shoot and edit. PE: With so little time, how did you determine which episodes you would provide commentary tracks for? SM: I got to pick and choose my shows mostly based on who I could find. I was to be a host /interviewer with folks that worked on the series. So many are gone, unfortunately, and that did limit my choices. Some actors wanted huge fees, so that let them out as well, along with their shows. As a film music fan I knew I had to get Jon Burlingame to do at least one track about the music. Initially we talked on the phone, and he was concerned about filling an hour of commentary time. I told him that we had been talking for nearly 45 minutes about the show and the music, and I wish I had recorded what we were chatting about. He laughed and agreed to do two tracks with me. I'm very proud of those two tracks we did together. Jon is a great guy and clearly he knows his stuff, having talked with so many composers from back in the day for his book: TV's Biggest Hits. I can't say enough good things about Jon. JS: Before we let you go, we put together a quick questionnaire for all of our interview subjects (James Lipton-style, with apologies to Bernard Pivot). PE: What's your favorite Thriller? SM: Tough call. Favorite is, of course, not the best show in the series... but since you are pinning me down... I would say... "Late Date". I love film noir and this is a good example of that genre. Also, as a fan of EC Comics it reminds me of something that might have been published in Shock Suspenstories. Larry Pennell looks a lot like the protagonists in those stories. Swell score by Goldsmith as well. PE: What aspect of Thriller turns you on? SM: I love the black & white photography! B&W can be so artful, when well done, and there was so much of it on display in Thriller. "Parasite Mansion"... "Pigeons From Hell"... "La Strega" for example... in color?! They would be different shows, and probably not as good. PE: What aspect of Thriller turns you off? SM: I was not always crazy about the casting. PE: What word best describes Thriller for you? PE: If Hell exists, what episode of Thriller would you expect to see shown on a continuous loop to people who arrive at the fiery gates? JS: Thanks Steve! Fans of the show will want to check Steve's commentaries on "The Twisted Image" with director Arthur Hiller, "The Purple Room" with actor Richard Anderson, "Papa Benjamin" with director Ted Post, "Parasite Mansion" with actress Beverly Washburn, "The Terror in Teakwood" and "La Strega" with soundtrack authority Jon Burlingame, additionally on "La Strega" with Gary Gerani and Craig Reardon, and "A Wig For Miss Devore with actress Patricia Barry. And just so you know - this is our second post of the day - we certainly wouldn't want you to miss out on our review of "The Watcher." Thanks Steve, not only for your work on the Thriller commentaries, but for your excellent "Combat" commentaries. I have the entire series in the box sets and find the commentaries to be of great interest. "Combat" was one of the very best war TV series. Wow, Mr. Mitchell has had an enviable career: working on two series to which my idol, Richard Matheson, contributed (COMBAT! and THRILLER), as well as one of my underdog favorite films, CASINO ROYALE. Too bad he couldn't arrange a Matheson commentary for "The Return of Andrew Bentley." I don't understand PARASITE MANSION being the one gets stuck with in hell. That is one of the good ones. WORSE THAN MURDER, MAN IN THE MIDDLE, MARK OF THE HAND. Those would make hell a place to avoid. Thanks Steve for making this my favorite ever TV collection! My choice of PARASITE MANSION was based on the nightmare quality of that show. It is a very creepy outing and my feeling that if there actually is a hell it might look and feel like PARASITE MANSION. Having JEANETTE NOLAN lurking about 24/7...? That would feel like Hell to me. Great episode of the series, with first rate art direction, photography, music and acting.